My sixty-third stadium of 2011 was on Tuesday 20th September 2011 at the Emirates Stadium in Holloway, London. The match was Arsenal vs. Shrewsbury Town in the Carling Cup 3rd Round. 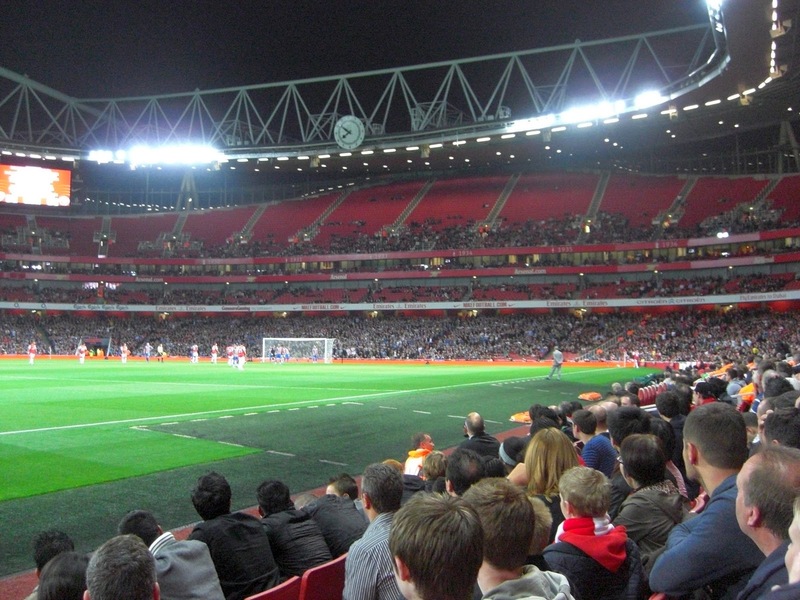 The Emirates Stadium is around 350 yards from Holloway Road tube station on the Piccadilly Line although there are several other tube stations in the vicinity of the ground. The stadium has been home to Arsenal since 2006 when they moved out of their Highbury which they had played at for the previous 93 years. This wasn't my first visit to the Emirates having been on a stadium tour in April 2008, though this was my first experience of a game at the venue. The ground is a four-tiered bowl with the majority of this taken by the standard seating of the lowest and highest tiers. The lower tier of the bowl holds around 24,400 fans with the upper tier holding around 26,600. The non-standard areas consist of two premium tiers - the 7,100 capacity 'club level' tier and above this a 2,200 capacity tier of boxes which cost around £80,000 a year to hire. Despite being a bowl structure, the stadium is divided into four quadrants - the East Stand, West Stand, North Bank and Clock End. These four stands are named after the four stands at Arsenal's previous ground Highbury and in recent years a replica of the original clock has been added to the Clock End. For the game I was sitting in the lower tier of the West Stand alongside my sister who is an Arsenal fan. The game was a League Cup 3rd Round tie between Premier League side Arsenal and League Two side Shrewsbury Town. The hosts started brightly and almost opened the scoring in the first five minutes but Shrewsbury quickly got into the game and almost took the lead after 13 minutes when they struck the post. A couple of minutes later though the visitors made their chance count with James Collins nodding in a cross to give them the lead. They then continued to attack Arsenal and very nearly doubled their lead. Eventually the Premier League side got into gear and headed an equaliser ten minutes before the break through Kieran Gibbs. In the second half Arsenal got on top of the game and took the lead when Alex Oxlade-Chamberlain shot into the bottom corner from 25 yards just before the hour mark. Shrewsbury continued to threaten but the Gunners looked the more likely to grab another which they did though Yossi Benayoun with 10 minutes remaining to seal a 3-1 win.